On January 17th, 1874, 62-year-old North Carolina resident Chang Bunker passed away in his sleep after having contracted pneumonia. Tragically, within a few hours, his brother Eng also died. 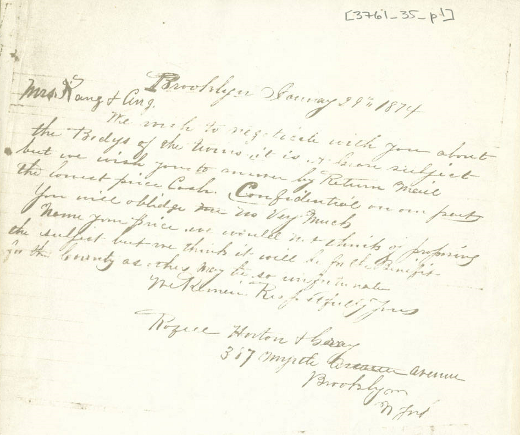 Less than two weeks later, the widows of Chang and Eng Bunker received the following letter from Brooklyn-based 'Rozell, Horton & Gray' in which the they were offered cash in return for the bodies of their late husbands. Usually, such a request would seem surprising, but Siam-born Chang and Eng Bunker had lived their entire 62 years joined at the sternum, their livers fused. As a result, the term 'Siamese Twins' was born. We wish to negotiate with you about the Bodys of the twins it is a (?) subject but we wish you to answer by Return Mail the lowest price Cash. Confidential on our part you will oblidge us very much. Name your price. We would not think of proposing the subject but we think it will be for the Benifit for the County as others may be so unfortunate.